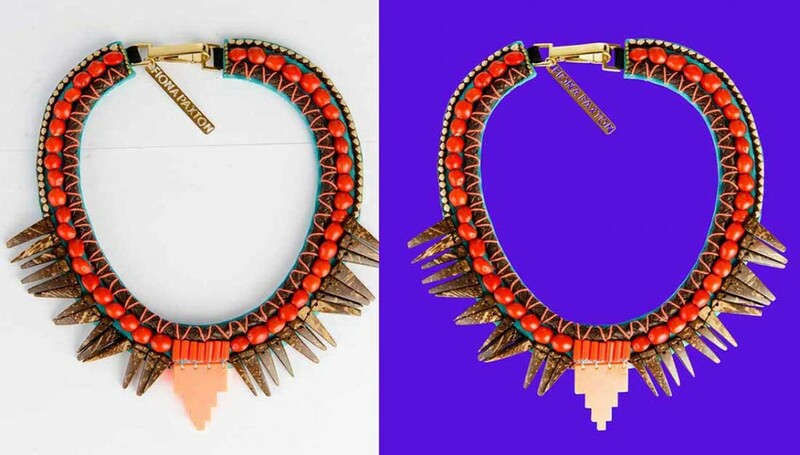 Learn Jewellery Photo Editing in Photoshop to attract your online customers. Want to increase sale and customers for your jewellery store? Please make your jewellery images attractive following those 4 easy photo editing steps. What you attract first to buy a jewellery image on online? Of course it’s attractive images used on website. This following content will convey the importance of jewellery photo editing in Photoshop to make jewellery images lucrative. To be 100% benefited keep in touch with this highly important writing. Jewelry has been one of the best-selling items so far. New jewellery images are coming every day, and people are buying them like crazy. If you are the owner of a jewelry shop and wants to attract more customers, then it is high time you should focus more on the website of your business. 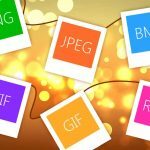 As you already know that, in today’s highly competitive marketplace the importance of digital photographs is vital from the marketing perception of any business and the same thing goes for jewelry business as well. If you are intended to sell the jewelry online, the items should look more attractive for grabbing the attention of, the clients. Even if the photographs of the jewelry are clicked by the professional photographers using the latest camera still there, you will find the attractiveness missing on the photos. In this case jewelry photo editor can help you to make your images attractive. This attractiveness is needed to cast a magic spell on the viewers to make them buy it. And only perfect jewellery photo editing in Photoshop can make the jewellery photos super attractive. For running a successful jewelry business, it is extremely crucial that the detailing of every nook and corner of the jewelry is vivid on the photo. This is the reason; it is essential to edit your photos from the professional photo editing companies to make it more eye-catching. Eliminating the unwanted background of the jewelry is imperative when it comes to enhancing beauty and attract customers. This is the first and foremost Jewellery Photo Editing step of making jewellery images attractive. You can do it very easily in Photoshop through photo cut out technique. When it comes to jewelry retouching, it is best to remove the unwanted background first with the help of clipping path service. Firstly, you need to create a mask so that unnecessary areas are black and the required areas of the picture are white. Secondly, you need to put a fill layer of white color underneath. Look carefully white selecting the necessary and unnecessary areas because you might leave some loops while remove background. Thirdly, manually go over the mask so that you make sure that you have selected every part of the chain, and each gap has been deselected. 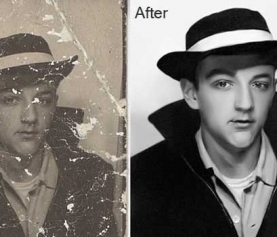 There are many picture background remover tools in Photoshop. This inevitably takes time, but the result will be fantastic. Finally, choose select> feather for softening the edge of the selection, then select inverse to protect the jewelry image, and choose the clone to stamp to cover the background of the image with either black or white color. While taking the picture, you need to make sure that, the lighting is perfect. Some people use green background behind the jewelry so it can easily be removed. When there is an unwanted background behind the jewelry, it dulls the quality and attractiveness of the picture. If you search in the web-page of the top jewelry brands, then you will find that the jewelry pictures have been showed in either white or black background. As a result, the client concentrates more on the jewelry. 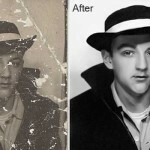 It is better to get this job done by a professional photo background remover as they are experts in these areas. 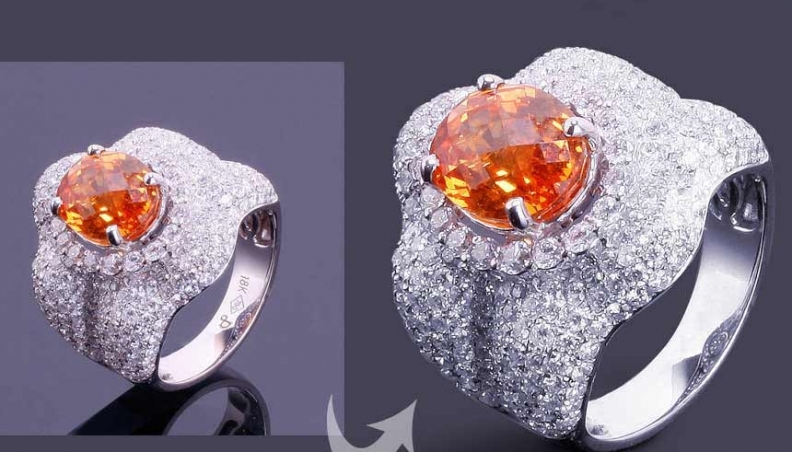 Retouching is the second step of jewellery photo editing to make the photo of the jewelry attractive to the clients. 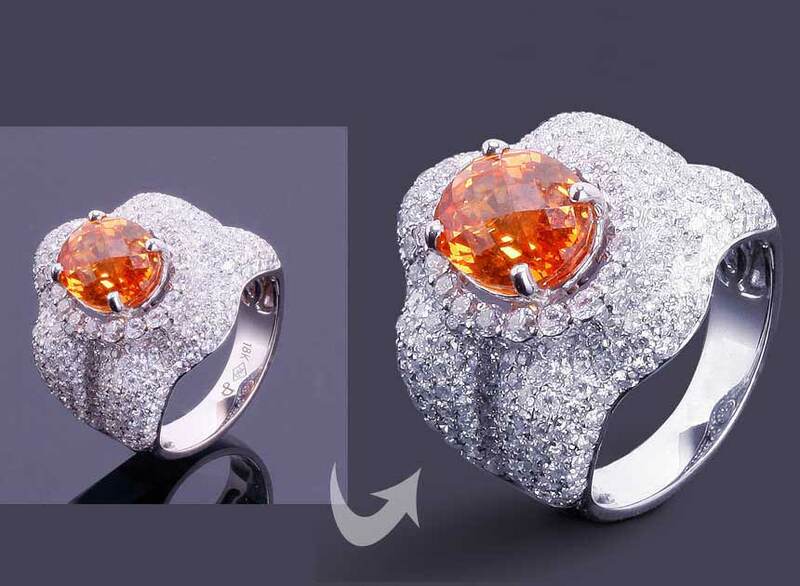 If there is any scratch or spot on the jewelry, you know that your customer will not show enough interest in buying it. These types of scratches and spots also decrease the value of the jewelry. This is the reason; you need to retouch the photo. Retouching the photo removes scratches and the superfluous marks on the ornaments make it unattractive. It is always better to use Photoshop because the quick edit apps degrade the quality of the photo. You can correct these flaws on Photoshop. First of all, if you want the jewelry to look better, then the best option is to photograph it in an environment where you have controlled lighting along with an adjustable flash of the camera. That means the jewelry product photography should be done in perfect way. Then, use Photoshop to remove scratches from the jewelry. 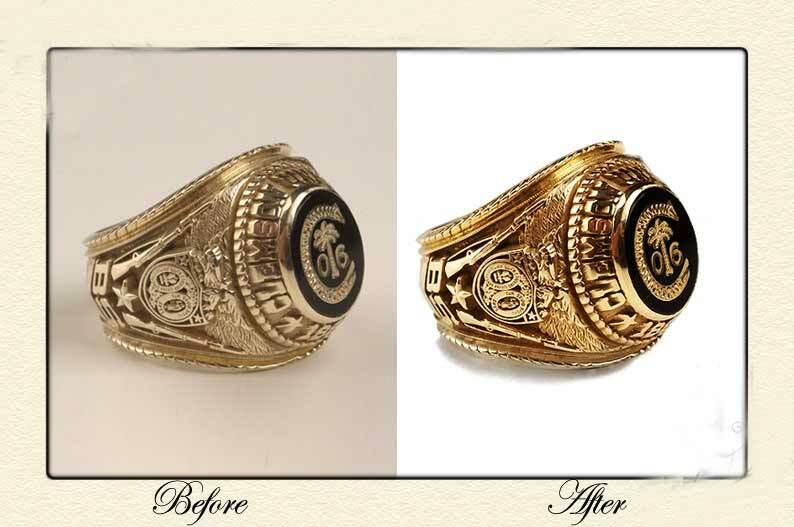 This process is called jewelry retouching service. There is a filter in Photoshop that can help you in this regard. The name of the filter is dust and scratches. For applying it in the image, you will find it in, Filter>Noise>Dust & Scratches. Now, you are required to apply and adjust the radius as well as the threshold values for finding a happy medium. This is surely not a one and done process. Some areas will be benefited, but other areas will lose the detailing. However, as you need perfectly detailed photo will less scratch, you should retain the original image as a separate layer and mask out all the things you want to preserve. Then, apply the Dust & Scratches filter to remove the scrapes. This jewelry retouching process will not just make your jewelry looks attractive but also make it look shiny in the photographs. Shooting the perfect image is the first step of the digital jewelry business. But if the photo is not able to show the detailing of the gems, metals and other aspects of the jewelry, then there is not the advantage of such photography. Here you should apply jewellery photo editing techniques. When it comes to jewelry retouching, it is critical to correct the hue, saturation, brightness, color, and contrast, etc. of the jewelry to make it more attractive to the customers. When it comes to detailing and color, then photos need to be very vibrant for capturing the attention of the buyer. If the picture that you are using in your web-page is dull and unattractive, then it surely cannot allure the customers to buy it. Not everyone can turn a necklace into fantasy, and this is the reason, you need to work on the colour correcting of the photo. For this reason, you need to have the right color and contract in the photographs so that; you can sell the jewelry piece to the possible customers. 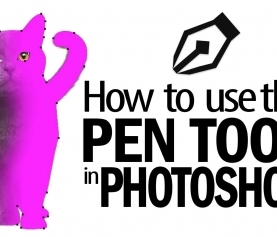 For this, you need to process your image in the Photoshop Light-room. Start off with the color balance, and then adjust the exposure, blacks, brightness and contrast of the photo. While editing the picture with the help of color correction service, you need to go easy on the contrast. Some people overuse the contrast. However, if you are looking for a perfect photograph of your jewelry then you need to follow the rule of thumb. This means, there should be something white, at least one small area and another completely black area as well for having the full dynamic range. Then, begin your work with the sharpening feature. Sharpen the essential which are an integral part of the image and where you want to focus more. It is always recommended to sharpen the fuzzy edges. In addition to this, do not forget to work in layers. This is because; layers offer a lot of flexibility. It makes an overall adjustment on the layer without changing the color, hue, contrast or brightness of the entire picture. You can modify the image in your way if you are working in filters. And you can also use many color correction software to edit the color of your images. 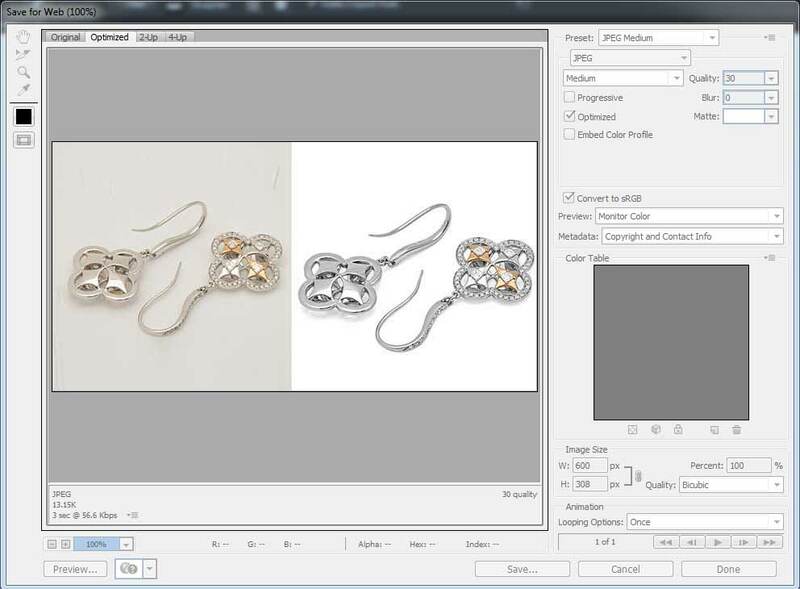 This is the most crucial part of jewellery photo editing that many people ignore. If you are in the jewelry business for a long time then you must be aware of the fact that you cannot use any picture on your website. You need to optimize it in the right way to make it appropriate for using it in the business web page. Trust me; you surely do not want Google to hate your company website. Fortunately, you are now able to reduce the size of the image for helping you to improve the performance of your website. Sometimes, if you do not lower the size of the file in the right way, then you will end up ruining the quality of the picture. A lot of the people ask how to maintain the size of the image even after jewelry retouching on editing software. For this reason, you need to choose the right file format, e.g. PNG, JPEG, GIF, etc. Then use the right software like, Photoshop, Gimp, FileOptimizer, ImageOptim, GIFsicle, JPEGtran, JPEG Mini, etc. to optimize the image. 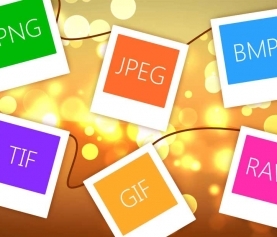 In this way, you can optimize a picture perfectly for your website. Or you can instruct your personal jewelry photo editor to apply those techniques. Image optimization is necessary because it will help you to use less storage space on the server, improve your SEO and also enhance the loading speed of your website. Photographing jewelry is a very adventurous job. When you are working with a smaller object, you will find that the products need a meticulous and painstaking approach. To attract clients to buy your jewelry you need to understand the importance of digital post-processing of the images. You need to spend hours for highlighting every detail of the jewelry, enhance the appeal and make it appropriate for any commercial purpose. These are the four top jewellery photo editing techniques that will help you to get the perfect jewelry retouching image for your business web page. As the editing of the Jewelry photos is critical, you need professional help from expert jewelry photo editor. If you are looking for an expert photo editing company to assist you in this regard, then you can contact us. We will take the photographs of the jewelry and make it eye-catching and alluring to the clients.